We firmly believe that you don’t have to be an SEO expert to leverage the power of SEO for your site, whether a small business or large corporation. A bit of SEO knowledge can go a long way, especially when you know your audience’s needs and the content that they are interested in. 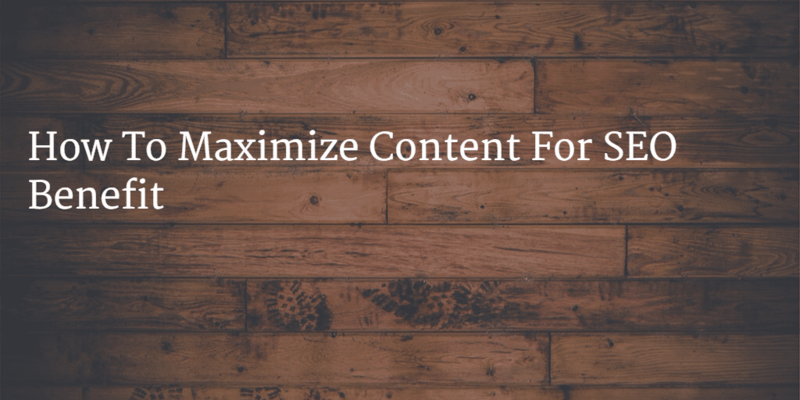 Here are some tips to maximize your SEO benefit for your content and ultimately your company’s bottom line. 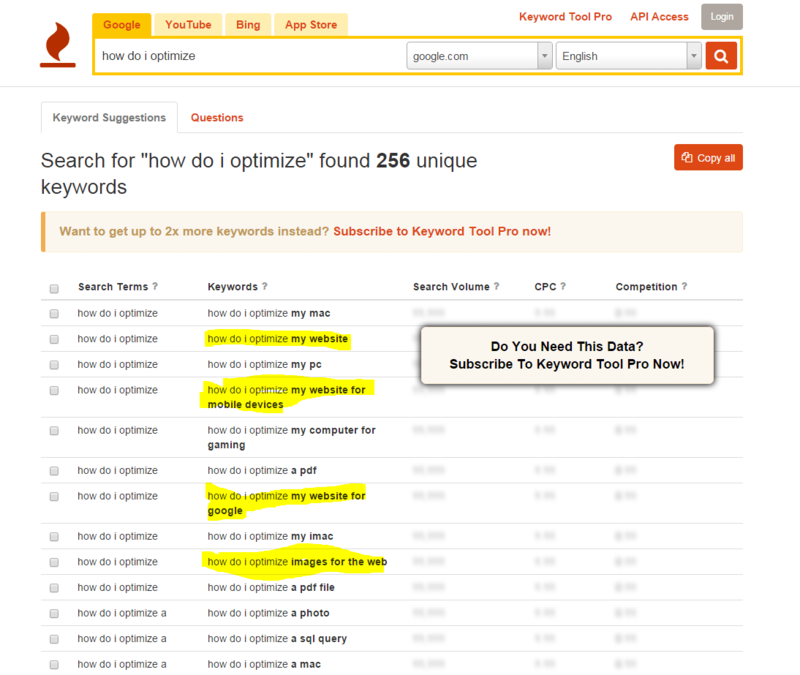 After repeating a few times you’ll have a list of keywords that are targeted to your audience. Now go to the Adwords Keyword Tool and input these keywords, find their search volume, and start writing content around those topics. Also read – The Persona Driven Keyword Research Guide. Another tactic we have commonly used is to find the online communities around your niche and see what questions people are asking. For example, if you are in the real estate space and have a blog, maybe go to Trulia Voices and see what questions people are asking, then answer those and reply back that you wrote a full post about it. 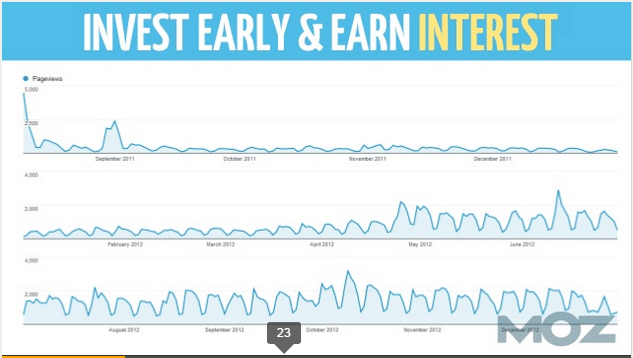 Then you get links plus a targeted audience plus referral traffic. The best way to build your business is to give more than you receive, and that includes sharing your knowledge far and wide. By directly answering the questions that you know your audience is asking, whether via Twitter, Facebook, or on other websites in your niche, you know that you are going to earn traffic that is already searching for what you have – they just do not know it yet! Write a blog post or two each week around a question that your audience has. If you already have an audience, ask them in emails what questions they have so that you might answer them. If your site is big enough, consider creating a forum of your own where people can ask questions and you can showcase your knowledge and expertise by helping them. Examples of some sites that have done this and leveraged their community, while earning SEO traffic along the way, are Moz, Clarity.fm, and many website forums. According to this post, the average length of a piece of content that ranks in the top 3 in Google’s search results is over 2,000 words long. It’s difficult to write that much content and not write a complete authoritative piece on the subject, and that is exactly the sort of content that the search engines want to rank highly. To do: If you use WordPress, use Yoast SEO. They take care of other SEO tasks for you too, such as adding content to your XML sitemaps to be indexed by the search engines. Other blog platforms usually have SEO best practices baked in as well, though they are less customizable than WordPress. Now we get to the fun part of using content for SEO – actually marketing it. You need to get your content in front of the right audiences, and what better way to do that than social media? If you’ve been building your social media audiences, you probably already have a fairly targeted audience. Be sure to share your content across your profiles on all the platforms – Facebook, Twitter, LinkedIn. Email your email list and tell them about it. Direct message some friends and ask them to share it. Yoast also takes care of the meta content required to make posts look good on social media channels. 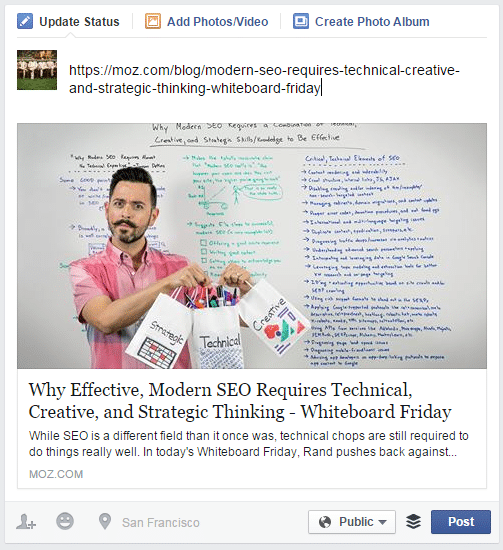 Here is a Facebook example of a Moz link being shared that looks good because they optimized the images and content. If you have any experience with paid social amplification, you can also fairly cheaply spread your content to your exact customer persona that you know needs the content you have just produced. If you’re really smart, you can target the content on Twitter to people who work at the online publications where you need coverage. A great way to spread your content and begin building your name as a thought leader in your space is to get some guest posts placed on authoritative websites that already have your audience as well. Jeff Goins, who became a fulltime writer and wrote about it here, wrote over 100 guest posts in his first year investing in his writing. That’s almost 2 per week. That’s a lot of writing, but could you manage one a month? Guest posting is not only a great way to build some links back to your site, but it’s also a great way to build relationships with others who have an audience that you can share your knowledge with. You could also try to get the site to share the email addresses of people who sign up for their site because of your content. This will help you continue to build your own audience. So to recap, why guest post? One great tactic to use is to write a blog post around a topic you know, then write a very similar post on another website and link back to your own. This way you could double stack the search results with your own content, rank your content first because it has more links than the other site’s piece of content, and start to dominate that niche. Blogging and content take a while to build an audience, but once you do it never goes away. Our founder, John Doherty, wrote on his own personal site twice a week for almost three years. Though he has publish fewer than a dozen posts in the last two years, his site still gets over 3,000 visits from the search results every month. Need to hire a marketing provider?